Play as Molli Pop as you fend off hordes of adorable ghosts in a twisted mansion forever haunted by the Phantom King! 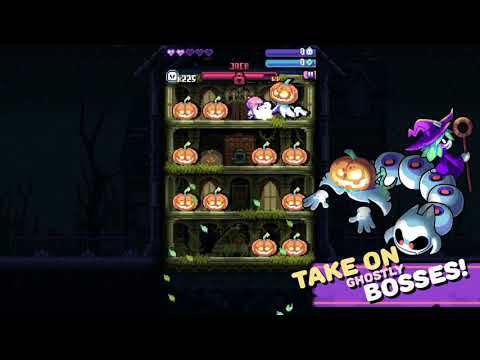 Power-up Molli with new flashlights and abilities as you level up - and team up with ghostly pups and other spectral creatures as you work together to clear the mansion of its sugar-craved evil! - Vaporize ghosts with a wide array of different, upgradeable flashlights; from cursed lanterns to magical beam swords, each flashlight provides a different way to play! - Need an edge to help overcome a difficult stage? Players can equip Charms to their flashlights, enhancing Molli with a multitude of different abilities and power-ups! Some charms even provide Molli with companions to aid her on her ghost-stomping adventure! - Upon completing a stage, players can choose from a randomized set of candies and curses that will provide permanent power bonuses for the remainder of that run. Will you restore all of your hearts hoping to last longer before an untimely demise? Or will you sacrifice defense for ultimate power? The choice is yours! - Visit 6 different regions of the Phantom King's mansion, each teeming with a variety of dangerous ghosts and ghouls. And be prepared to face-off against a mighty boss at the end of each stage! - Participate in Daily Challenges that offer various rewards! Controls: Control Molli by swiping the screen. Molli runs in one direction automatically, and swiping left or right makes her change direction. Swiping up or down will make her jump between floors. Certain flashlights you can use offer slightly different control schemes.